The Cathedral Basilica of SS. Peter and Paul was filled with people in pews and folding chairs for the Mass Oct. 15. WASHINGTON (CNS) — The naming of St. Mary Church in Alexandria, Virginia, is the 84th such creation of a basilica in the United States. In all, 33 states and the District of Columbia have churches designated as minor basilicas. The earliest extant structures to be so designated are Minneapolis’ Basilica of St. Mary and Our Lady of Victory National Shrine and Basilica in Lackawanna, New York, both in 1926. Virginia’s Basilica of St. Mary is the latest. New York has the most of any state, with nine; California, Florida and Pennsylvania each have six. 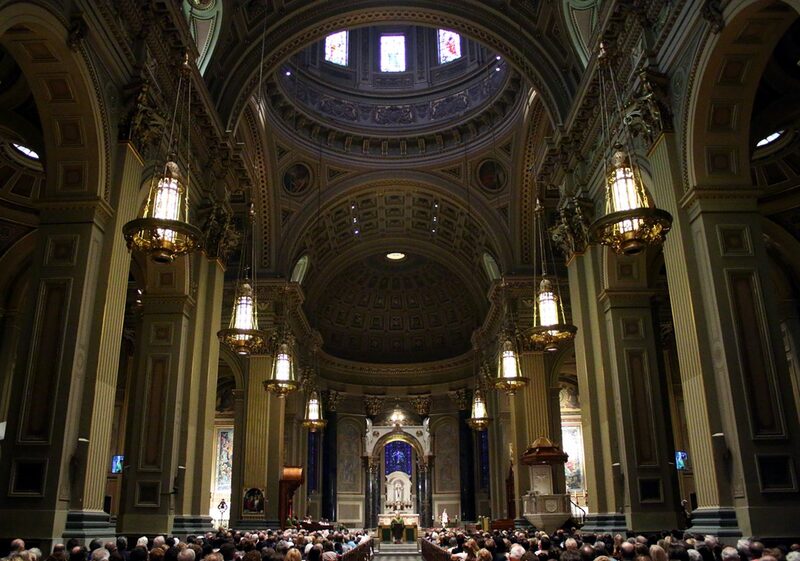 Following is a listing of all 84 U.S. basilicas alphabetically by state, and alphabetically by city within a state where necessary, plus the year it was designated a basilica. Alabama: Mobile, Cathedral Basilica of the Immaculate Conception, 1962. Arizona: Phoenix, St. Mary’s Basilica, 1985. California: Alameda, St. Joseph’s Basilica, 1972; Carmel-by-the-Sea, Basilica of Mission San Carlos Borromeo de Carmelo (Carmel Mission), 1960; San Diego, Basilica of Mission San Diego de Alcala, 1975; San Francisco, Basilica of Mission San Francisco de Asis (Mission Dolores), 1952; San Jose, Cathedral Basilica of St. Joseph, 1997; San Juan Capistrano, Mission Basilica San Juan Capistrano, 2000. Colorado: Denver, Cathedral Basilica of the Immaculate Conception, 1979. Connecticut: Stamford, Basilica of Saint John the Evangelist, 2009; Waterbury, Basilica of the Immaculate Conception, 2008. District of Columbia: Washington, Basilica of the National Shrine of the Immaculate Conception, 1990. Florida: Daytona Beach, Basilica of St. Paul, 2006; Jacksonville, Basilica of the Immaculate Conception, 2013; Key West, Basilica of St. Mary Star of the Sea, 2012; Orlando, Basilica of the National Shrine of Mary, Queen of the Universe, 2009; Pensacola, Basilica of St. Michael the Archangel, 2011; St. Augustine, Cathedral Basilica of St. Augustine, 1976. Georgia: Atlanta, Basilica of the Sacred Heart of Jesus, 2010. Hawaii: Honolulu, Cathedral Basilica of Our Lady of Peace, 2014. Illinois: Chicago, Our Lady of Sorrows Basilica, 1956; Chicago, Queen of All Saints Basilica, 1962; Basilica of St. Hyacinth, 2003. Indiana: Notre Dame, Basilica of the Sacred Heart, 1991; Vincennes, Basilica of St. Francis Xavier, 1970. Iowa: Des Moines, Basilica of St. John, 1989; Dyersville, Basilica of St. Francis Xavier, 1957. Kansas: Victoria, Basilica of St. Fidelis, 2014. Kentucky: Bardstown, Basilica of St. Joseph Proto-Cathedral, 2001; Covington, Cathedral Basilica of the Assumption, 1953; New Haven, Basilica of the Blessed Virgin of Gethsemani, Abbey of Gethsemani, 1949. Louisiana: Natchitoches, Basilica of the Immaculate Conception, 2009; New Orleans, Cathedral Basilica of St. Louis, King of France, 1964. Maine: Lewiston, Basilica of Saints Peter and Paul, 2004. Maryland: Baltimore, Basilica of the National Shrine of the Assumption of the Blessed Virgin Mary, 1937; Emmitsburg, Basilica of the National Shrine of St. Elizabeth Ann Seton, 1991. Massachusetts: Boston, Basilica and Shrine of Our Lady of Perpetual Help, 1954; Chicopee, Basilica of St. Stanislaus, 1991; Webster, St. Joseph Basilica, 1998. Michigan: Grand Rapids, Basilica of St. Adalbert, 1979; Royal Oak, National Shrine of the Little Flower Basilica, 2015. Minnesota: Minneapolis, Basilica of St. Mary, 1926; Winona, Basilica of St. Stanislaus Kostka, 2011. Mississippi: Natchez, St. Mary Basilica, 1998. Missouri: Nodaway County, Basilica of the Immaculate Conception, Conception Abbey, 1940; St. Louis, Basilica of St. Louis King of France (Old Cathedral), 1961; St. Louis, Cathedral Basilica of St. Louis, 1997. New Jersey: Newark, Cathedral Basilica of the Sacred Heart, 1995. New Mexico: Mesilla, Basilica of San Albino, 2008; Santa Fe, Cathedral Basilica of St. Francis of Assisi, 2005. New York: Brooklyn, Basilica of Regina Pacis, 2012; Brooklyn, Basilica of Our Lady of Perpetual Help, 1969; Brooklyn, Cathedral Basilica of St. James, 1982; Lackawanna, Our Lady of Victory National Shrine and Basilica, 1926; Lewiston, Basilica of the National Shrine of Our Lady of Fatima, 1975; New York, Patrick’s Old Cathedral, 2010; Olean, Basilica of St. Mary of Angels, 2017; Southampton, Basilica of the Sacred Hearts of Jesus and Mary, 2011; Syracuse, Basilica of the Sacred Heart of Jesus, 1998. North Carolina: Asheville, Basilica of St. Lawrence, 1993; Belmont, Basilica of Our Lady Help of Christians (Belmont Abbey), 1998; Wilmington, Basilica Shrine of St. Mary, 2013. North Dakota: Jamestown, St. James Basilica, 1988. Ohio: Carey, Basilica and National Shrine of Our Lady of Consolation, 1971; Canton, Basilica of St. John the Baptist, 2012; Marietta, Basilica of St. Mary of the Assumption, 2013; North Jackson, Basilica and National Shrine of Our Lady of Lebanon, 2014; Youngstown, Basilica of Our Lady of Mount Carmel, 2014. Pennsylvania: Conewago Township, Basilica of the Sacred Heart of Jesus, 1962; Danville, Basilica of Sts. Cyril and Methodius, 1989; Latrobe, St. Vincent Archabbey Basilica, 1955; Loretto, Basilica of St. Michael the Archangel, 1996; Philadelphia, Cathedral Basilica of Saints Peter and Paul, 1976; Scranton, Basilica of the National Shrine of St. Ann, 1997. Tennessee: Chattanooga, Basilica of Sts. Peter and Paul, 2011. Texas: Beaumont, St. Anthony Cathedral Basilica, 2006; Galveston, St. Mary’s Cathedral Basilica, 1979; San Antonio, Basilica of the National Shrine of the Little Flower, 1998; San Juan, Basilica of the National Shrine of Our Lady of San Juan del Valle, 1999. Virginia: Alexandria, Basilica of St. Mary, 2018; Norfolk, Basilica of St. Mary of the Immaculate Conception, 1991. West Virginia: Charleston, Basilica of the Co-Cathedral of the Sacred Heart, 2009. Wisconsin: Hubertus, Basilica of the National Shrine of Mary Help of Christians at Holy Hill, 2006; Milwaukee, Basilica of St. Josaphat, 1929.